Like many radio amateurs I have collected a large collection of recharchable batteries. Some are over 10 years old an others were obtained from sources like flee markets and disassembled broken laptops. I have noted that some packs seems to have degraded over the years and could only store a fraction of their promised capacity. The cheap solution was to charge the battery, hook up a resistor and a voltmeter and regularly check the voltage of the battery. As this is rather time consuming if you discharge with .1 C and you often tend to forget the check the voltage I decided to make a small device which would automate this. Nowadays you can get microcontrollers with built-in A/D convertors for a few Euros so this should not be a problem. The Battery Capacity Meter descibed below is the result. You hookup a fully charged battery and load resistor to the meter, enter the value of the resistor and the cutoff voltage and start a discharge cycle. 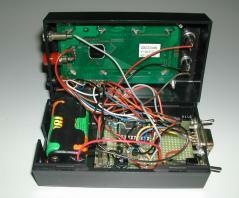 The meter will switch on the load using a power mosfet and continiously measure the battery voltage. 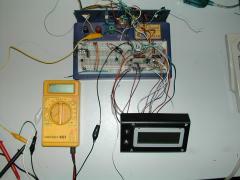 To precisily measure the voltage a reference diode is used. During the discharge you can select to display the current voltage and current or the time expired and capacity so-far. If the cutoff voltage is reached the load will be disconnected and the capacity will be shown on the LCD display. Because a resistor is used as load and not a current source the current will vary over the discharge cycle. A Lithium/Ion cell will e.g. supply a voltage of 4.1 V when fully charged and 3.3 Volt when it is depleted. With a 10 ohm load the current will vary from 410 mA at the start to 330 mA at the end of the discharge cycle. The meter will however use a sample every minute and calculate the supplied power in milliAmpMinutes during the last minute. This is totalled to display the overall capacity of the battery. To allow plotting of the discharge curve you can set an interval to store the measured values, e.g. once every 5 minutes. After, or during, the discharge this data can be transferred to a PC via an RS-232 interface. With the use of a spreadsheet program a discharge curve can be plotted. As only 128 samples can be stored in memory the battery should be depleted before this buffer runs full. The fastest sample rate (once every 5 minutes) allows a maximum discharge time of 10.5 hours, the slowest sample rate (once every 20 minutes) allows a discharge time up to 42 hours. To enable transmission of the data to the PC just press the adjust/send button. This can be repeated multiple times (as long as the meter is not reset). 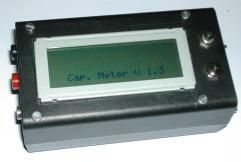 When the meter is switched on the display will show a version message like this: "Cap. 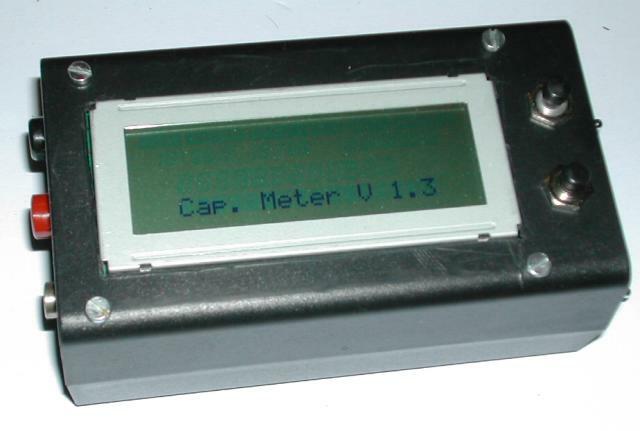 Meter V 1.6".The meter is controlled by two push buttons, an Adjust/Send button to modify the settings or to send the data over the serial interface, and an Enter/Go button to advance to the next menu or start the discharge cycle. When the enter button is pressed the backlight is turned on and an internal power check is performed. If the battery voltage is below 4.5 Volts the message "* Battery low *" is displayed indicating that the meter may run out of power during the next measurement cycle, you decide to ignore this and pres the Enter button again. Now the external settings should be entered, in the next menu the Voltage Range is specified ("V Range 05.00V"), use the Adjust button to select the range which is required, use the Enter button if the correct setting is shown. The next step specifies the value of the load resistor which is used to discharge the battery ("Load R 050.0 ohm"). Select the proper value and press the Enter button again. Please note that the load resistor should be identical to the specified value, especcially with low resistor values (e.g. 10 ohm), difference with the actual value (e.g. 10.3 ohm) will introduce large errors in the accurary of the result. Use a parallel resistor to end up with a load with is a multiple of .5 ohm !! Finally the cut-off Voltage (The voltage at which the meter will stop discharging the battery) should be entered ("V Cutoff 3.00V"). NiCd and NiMH batteries are depleted if the voltage reaches 1.0 V per cel, Lithium-ion 3.0 V per cel and Lead-acid based batteries at 1.75 V per cel. After accepting all settings the voltage of the battery-under-test is shown, you can now connect the battery and load resistor. If the enter button is pressed the load will be switched on an the measurement will start, if you made an error during the entry phase just switch the power of the device off and on. During the discharge the actual voltage and current are displayed. Pressing the Enter button will toggle between this display and a display where the duration (HH:MM) and capacity so-far are displayed. Pressing the Adjust/Send button will transmit the discharge curve and capcity. Pressing either button will also turn the backlight on for a brief period. When the cut-off voltage is reached the load resistor will be disconnected and the resulting capacity will be shown ("Ready 01365 mAh"). You can now connect e.g. a PC and receive the Discharge Curve. Initially every 5 minutes the voltage is stored, when more than 128 samples are received, the system will switch to sampling once every 10 minutes and so on. The best results (most accurate) are achieved with discharge durations of a few hours up to 15..20 hours. At very short durations (high currents) the measurement is influenced by the inaccurary of the load resistor (e.g. influence of the wiring, connector and MOSFet ON resistance), with very long durations the accuracy if effected by the dynamic range of the internal floating point variables. Most components are not critical, I used whatever was available in my junk box. The exception is the divider network: I used 1% resistors and selected matching pairs using my ohm-meter. For the 2N5401 any low power pnp transistor will suffice, for the BS170 any low power n-channel fet will do. For the power mosfet you can also use any type although logic-level FETs are recommended. The important issue is the Rds(on) resistance, this should be as low as possible so preferably select e.g. at least an 20 Amp type as they have "ON" resistances which are lower than 0.05 ohm (e.g. the BUZ11A). This seems overkill as you will normally discharge with currents less then 1A (At least, that's how I use the device) but the ON resistance is the critical factor here. I like to live dangerous, so mistakes duringusage (e.g. reversing the polarity of the test battery) will damage the meter. The design can be changed to prevent this, also the accuracy can be improved. Some possible enhancements are listed below. When the terminals for the load resistor are shortcutted you will immediately blow the mosfet. The battery will also not like this. To prevent this a fuse should be added in series with the resistor. Connecting the test battery with the polarity reversed will also destroy the microprocessor. Add a fast Scottky diode over the two terminals (and, also install the fuse, otherwise you will just blow the diode, followed by the processor). The voltage measurement circuit can be improved in two ways: (1) The resistor netwerk draws a current from the battery which is not used in the calculation (2) The output resistance is to high, the analog channel will draw some current (typ. 500nA) also introducing an additional measurement error. 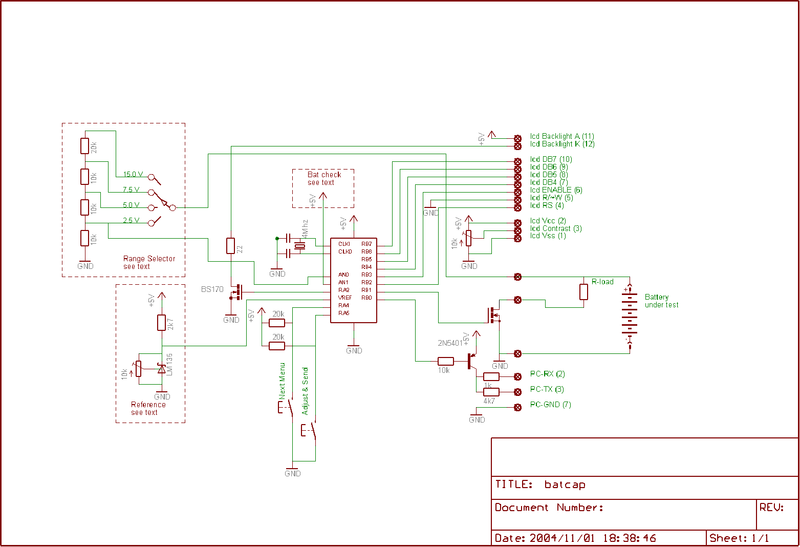 Both problems can be solved by adding a rail-to-rail op-amp (e.g. an LM358) before the analog input pin and replacing the 10k and 20 k resistors with 100k and 200k versions. Connecting a 12V battery while a low voltage range is selected will damage the analog input. To protect the analog input add a 5.6 V zener between the ground and analog input channel (or before the op-amp if this is used). The "psuedo" rs-232 interface can be replaced with a MAX232 level converter chip to supply + and - 12 V on the RS-232 signal lines. The MAX-232 can then also supply a negative contrast voltage to the LCD display (if this is required). The disadvantage is that usage of the MAX232 chip will double the current drawn by the circuit, thus halving the life time of the battery. Using 2 lithium/ion cells as ower supply will allow you to add a low-drop precision regulator like the LM2950 and keep the supply voltage constant. You can then even omit the LM136 and connect the +5V directly to the VREF pin. Do not try this with an 7805 type regulator, there is too much variation in it's output voltage !! The debouncing code for the "Adjust" button should be improved. 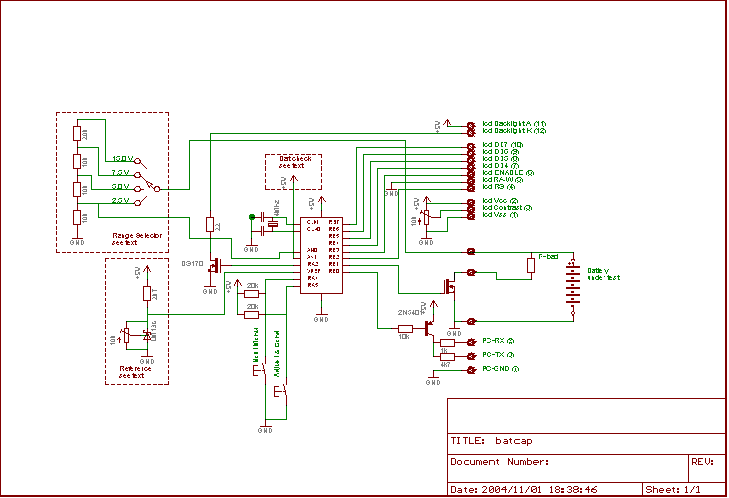 The PIC16F819 is equipped with a 10 bit A/D convertor, the current version uses the high 8 bits. Using all bits will improve the accuracy.